Many different stimuli such as growth factors, cytokines, viral infection, ligands for G protein-coupled receptors and transforming agents activate the mitogen-activated protein kinase (MAPK) pathway. 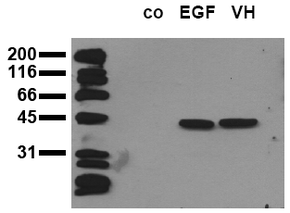 MAPK is also called extracellular signal regulated kinase (ERK). Activation of the MAPK pathway is mediated via monomeric GTPases of the RAS-family. RAS is able to transmit cellular signals from G protein-coupled receptors as well as from receptor (associated) thyrosine kinases, which in turn are mediated via adaptor molecules like Grb2/SOS. RAS activates the so-called MAPKKK (MAPK kinase kinase) with c-Raf (RAF1) being one of the best described members of this group. Once activated, c-Raf phosphorylates two serine residues in the downstream MAPKK, also called MAP/ERK kinase (MEK). 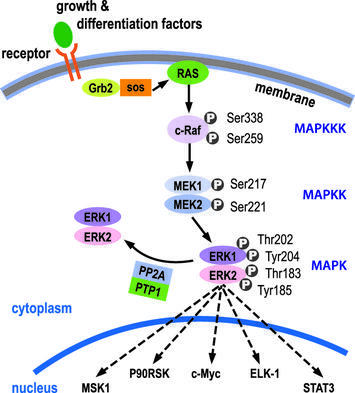 MEK1 and 2 are dual specificity protein kinases and phophorylate the following MAP kinases, the best described members being ERK1 and ERK2, at tyrosine and threonine residues. All MAP kinases known are characterized by their requirement for this dual phosphorylation for full activation at conserved T-X-Y motif. 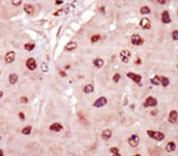 Upon activation, the MAPKs/ERKs either phosphorylate a number of cytoplasmic targets or migrate to the nucleus, where they phosphorylate and activate transcription factors such as c-Myc and ELK-1. Today, many different MAPKs/ERKs and MEKs are known and each are activated by different upstream stimuli like growth factors, UV-mediated stress, cytokines or even cell-cell interaction. 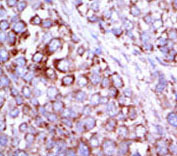 Other well-described MAPKs are c-Jun N-terminal kinases (JNKs) and members of the p38-MAPK family. 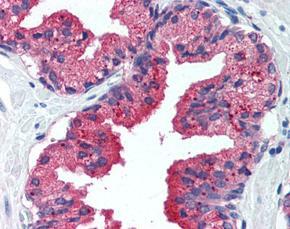 OriGene Technologies offers a range of thoroughly evaluated monoclonal and polyclonal antibodies to different members of the MAP kinase cascade, including products for immunohistochemical applications on frozen or paraffin embedded sections, immunofluorescence and/or Western blotting. 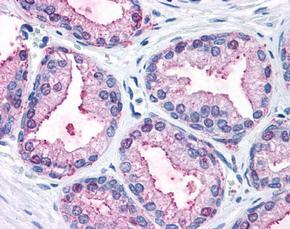 This collection is extended by Abnova antibodies distributed by OriGene Technologies within Europe and the USA. Further products, e.g. antibodies to c-Raf, JNK and p38 MAPK can be found via the above input field ‘Search’. Ji RR et al. : p38 MAPK, microglial signaling, and neuropathic pain. Fischer AM et al. : The role of Erk1 and Erk2 in multiple stages of T cell development. Immunity, Oct 2005; 23(4): 431-443. Seternes OM et al. : Activation of MK5/PRAK by the atypical MAP kinase ERK3 defines a novel signal transduction pathway. EMBO J, Dec 2004; 8; 23(24): 4780-4791. Erratum in: EMBO J, Feb 2005 23; 24(4): 873. Sohn SJ et al. : Transcriptional regulation of tissue-specific genes by the ERK5 mitogen-activated protein kinase. Mol Cell Biol, Oct 2005; 25(19): 8553-8566.